At this time of year, just before the trees start to show their buds, the forest is rich with greens from the moss and ferns. It is gorgeous, and inspiring friends as well as myself. Jane has been taking beautiful photographs of her finds in the forest. 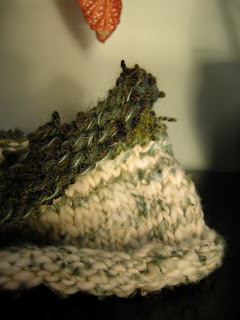 I asked Liz to spin a yarn that would evoke the flaky white bark of Birch and Alder, with patches of moss. This resulted in this seamless round knitted scarf. Last week I started felting again, inspired by the ferns this shoulder bag came out. Yesterday a friend inquired about the felt baby jackets and was wondering which ones I still have. I had to take some new pictures and Lief enjoyed modeling them for me. 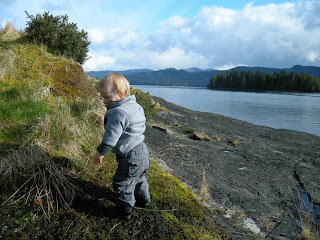 Such a gorgeous day, we spent quite a bit of time playing on the beach and in the forest. Spring seems to be arriving, we heard many birds whistling and chattering! 2. Be part of the online community of more than 100,000 crafty sellers who all make handmade items! And who knows how many buyers. There's probably a lot more reasons, but these come first to my tired computer mind. I have uploaded a 'widget' on this blog, so you can directly see what's in my store. Just one click away! Enjoy.